The No. 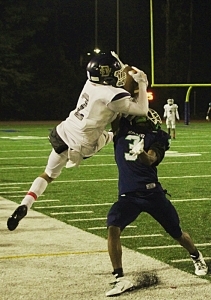 9 ranked Southwest DeKalb Panthers remained undefeated as a fourth down pass from Rion White to Aquil Muhammad with 1:25 to play rallied the Panthers past two-time Region 5-5A champions Arabia Mountain Rams to a 20-19 win. Trailing 19-13 with just over two minutes to play, the Panthers (9-0, 4-0) forced a Rams’ punt which Muhammad returned 15 yards to the Arabia Mountain (5-4, 3-1) 40-yard line. Following a pair of incomplete passes the Panthers were facing a fourth and six at the Rams’ 36 with one play to get a first down and keep their drive alive when White dropped back to pass. White’s pass on a slant across the middle to Muhammad was right on target hitting Muhammad in stride as he avoided a tackle heading towards the right sideline a group of blockers who sprung him down the sideline for the 36-yard game-tying touchdown with 1:24 to play in the game. Reano Ramjag came on for the PAT and kicked it through for the 20-19 lead. A squib kick was fielded at the Rams’ 40-yard line and Arabia Mountain needed to get within field goal range at least to have the opportunity for a third consecutive Region 5-5A title. A third down pass for the Rams went incomplete and they found themselves in a fourth and four and one last chance to move the ball downfield as the clock had ticked up 50 seconds to play. The Southwest DeKalb defensive pressure forced an incomplete pass with 39 seconds to play and the Panthers took over on downs. White knelt down and Southwest secured its first region title since Coach Buck Godfrey’s 2009 squad went 10-2 on the way to capturing the Region 6-4A title. 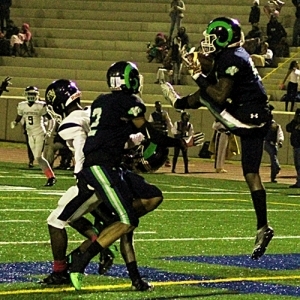 Arabia Mountain opened the game driving into Southwest DeKalb territory only to have the Panthers’ D’Won Mason intercept a pass and return it out to the Panthers’ 45. It took just one play for Southwest DeKalb to strike for an early lead as White threw down the left sideline to Bryant Ulmer for a 55-yard scoring strike. Ramjag’s PAT made it 7-0 with 9:55 left in the quarter. The Rams answered on the kickoff as Jordan Grier squeezed through the middle of the coverage team and raced 88 yards just 23 seconds later. Malcolm Grinnell tied the game at 7-7 with his PAT. Southwest DeKalb took a 13-7 lead on a 70-yard punt return by tommy Wright who at first bobbled the punt, gained control, broke a tackle and raced down the left sideline to give the Panthers a 13-7 lead with 7:57 left in the third quarter. Arabia’s Thomas Douglas blocked the PAT. The Rams came back to tie the game as Bryson Williams hit Corey Rolle on a quick slant from the 10-yard line to knot the game at 13 all with 1:49 left in the third quarter. Southwest DeKalb’s John Grant made sure it stayed tied with a block of the PAT. Arabia Mountain took the lead on another Williams to Rolle slant pass, this time for 12 yards to make it 19-13 with 9:17 to play. The two-point try was no good. In other Region 5-5A action, Columbia (2-7, 1-3) defeated Chamblee (0-9, 0-4) 53-7 and Lithonia (6-3, 3-1) defeated Miller Grove (2-7, 1-3) 42-20. Stephenson (8-1, 7-0) and Tucker (7-2, 7-0) remained undefeated in Region 4-6A play with wins over the weekend to set up a big showdown for the region title on Friday night at Hallford Stadium. Tucker ran past Mt. Zion-Jonesboro 57-7 on Thursday night at Tara Stadium. Stephenson rallied from a 28-27 deficit by outscoring Lovejoy 17-7 in the fourth quarter to win 44-35. Martin Luther King Jr. (1-8) dropped another heartbreaker in a 34-32 loss to Charles Drew on Friday at Godfrey Stadium. The Dunwoody Wildcats picked up their second victory of the season and first region 7-6A win by downing Chattahoochee 23-14 on Homecoming at North DeKalb Stadium last Friday night. The Wildcats (2-7, 1-6) got out to a 16-7 lead in the third quarter and held off Chattahoochee for the win.